The Riverside County Office on Aging provides a hot lunch on weekdays from 11:30AM-12:30PM. Participants must meet age and income requirements. Donations are appreciated. Call Sodexo at (951) 827-3613 to register for the lunch program. Download Menu. ***Please Note: Reservations for St. Patrick's Breakfast are required by March 9th*** "Great Starts at Goeske" is a comprehensive educational nutrition program that focuses on the importance of balanced nutrition for older adults. 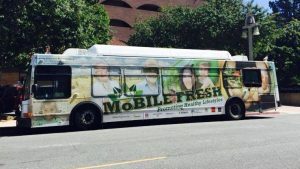 Participants enjoy a deliciously nutritious meal accompanied by an educational handout that contains a breakdown of the entire meal and helpful nutrition tips. 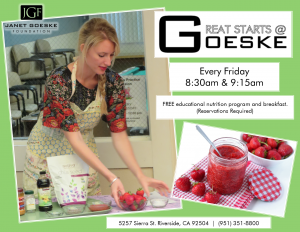 Great Starts also features monthly health presentations and quarterly cooking demonstrations. 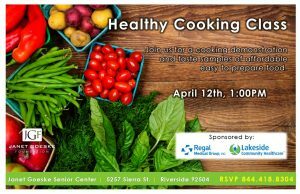 Cooking demo and samples of healthy, easy to prepare food. Lunch is free for patrons 60 and up who have filled out a Sodexo application and $3 for patrons 60 and up who have not. Lunch is $5 for patrons under 60.